Join Daniela on Thursday, March 15, 22, & 29 from 2-4pm. $85 plus materials. Fabergé Eggs are beautiful, but most of us probably only get to admire them in museums… So, how about knitting yourself a Fabergé Shawl? Intricate and beaded, this pattern is a bit on the complex side, and while none of the parts are difficult, you will need to pay attention to the different parts. 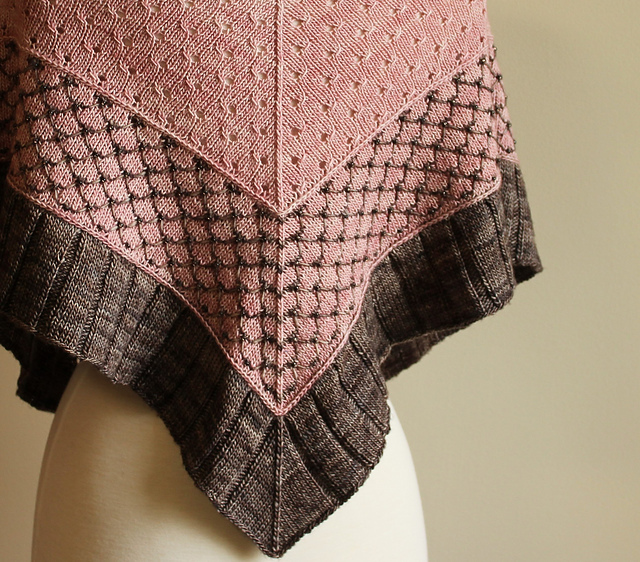 This shawl comes in three different sizes and is knit from the bottom up, first the ruffle, a braid, and then you get to the exciting overlay part with the beads. You will learn how to make a horizontal braid, work a slipped stitch overlay, and beading. Included in the pattern are instructions for a small swatch that uses all the stitch patterns so that you can familiarize yourself with the techniques and try out your color choices – you will need a certain amount of contrast for the overlay to show up. The result is spectacular!